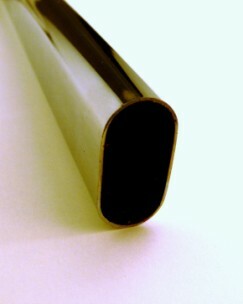 Sliding door interiors and hanging rails all from one manufacturer. 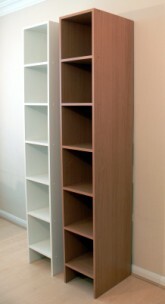 Interior shelf unit kit (£89 + VAT) comprises of a shelving tower unit with 6 shelves, it's really easy to put together. 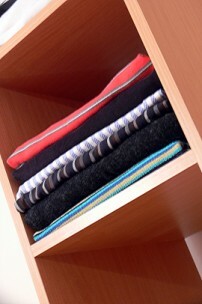 It measures 82 3/4"h x 13 1/4"w x 18"d (2100mm h x 345mm w x 457mm d) You will find that this is just the correct width to take folded up clothes keeping them neat and tidy without wasting any space and just as important (like what is usually available) I don't skimp on the number of shelves I put in them. They also come with 2 Heavy duty chrome oval hanging rails at 98" (2500mm) with enough chrome end fixings (8) to support 4 cut lengths of rail. Making shelf units the width that I do, makes much better use of space, the only drawback is that they are a little narrow for drawers. If you find drawers really are necessary I always recommend purchasing a small drawer unit off the shelf and placing this inside the wardrobe. Interior shelving boards (£18+VAT each) in White and Beech 103" x 18"x 3/4" (2600mm x 457mm x 18mm) use these for top shelves divisions etc you can use them to create your own bespoke interior or use them for top shelves above the shelf unit. It is from these boards that I make the Interior shelf unit kits. 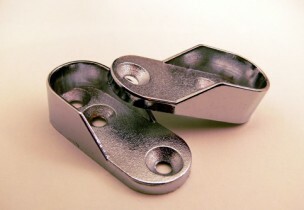 Chrome end cups (£1.50+VAT per pair) for hanging rail, I sell these in pairs. 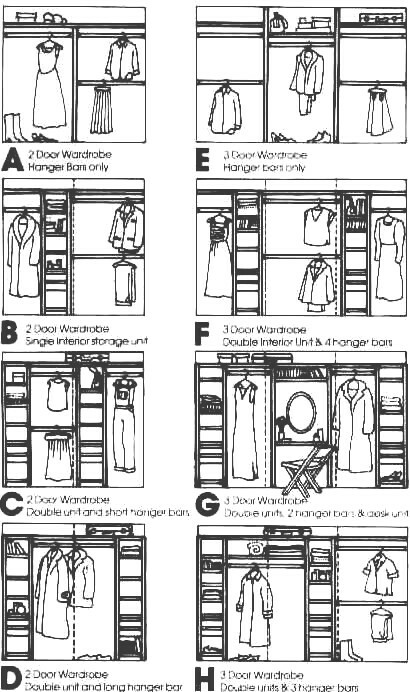 Here are a few ideas for sliding mirror wardrobe interiors, the best interior layout (in my opinion) for a 2 door sliding wardrobe is A and B and for a 3 Door sliding wardrobe E and F.